Ganondorf needs to be unlocked. Ganondorf returns from Super Smash Bros. Melee! Ganondorf is no longer a complete clone of Captain Falcon, having more standard attacks unique to himself, while retaining his sheer power. Ganondorf is a standard heavyweight, trading speed for power, but he has more difficulty facing other characters than most heavyweights, as he is saddled with a lot of weaknesses. He appears at the bottom of the competitive tier list, but is still a viable character if played well. Ganondorf extends his arm and shocks his opponent. It is one of your fastest ground moves and a decently good move to knock opponents who are trying to pressure you away. It is still pretty sluggish for a normal A attack, and you are almost certainly going to get grabbed if your opponent shields it. Ganondorf kicks forward. The move is a bit laggy, but it's range and knockback angle is great. Use it to counter approaches, punish your foes or to knock them offstage and into a bad position. Only use it defensively, because it is slow enough to be punished easily. Holds his leg up for some time then crashes down. This move is very, very slow. In fact, it's so slow you probably won't ever land it against a decent opponent. However, it has a wierd vacumn effect when charging. If you do manage to land it, it has deceptively great range and humongous power, with the center killing at around 30%! Ganondorf kicks lowly. One of Ganondorf's faster moves and it has great range. It has better priority than your other moves and can launch your opponent just slightly into the air, where they have few options which you can counter if you predict correctly. It is also a great followup after a Flame Choke. Ganondorf charges forward. This move is very powerful, fast and sends Ganondorf a good distance forwards. It is great for punishing attacks, anti-air, following up a Flame Choke or as a finisher. It does suffer quite a bit from stale move negation, so you have to decide whether to use it often in a match for its speed and priority, or to save it for a quick KO move. Ganondorf thrusts his elbow out. Although it is rather slow, it is quite powerful. It pushes shielding opponents back far enough that you won't get counteattacked most of the time if your opponent shields. Your opponents can still find ways to easily punish you, as the move is quite slow. Therefore, you should only use it to punish opponents in endlag or to counter reckless approaches. This move is one of your main finishers, KOing most characters at around 70%. A simple but useful technique is stutter-stepping, in which you tap the opposite direction of where you're aiming your smash attack and immediately use the C-stick or the second joystick to perform a forward smash. If done right you will move further forward when you attack, catching opponents just out of range. Ganondorf kicks upwards. It has a sweetspot around the foot that deals additional damage and knockback. It is very good at dealing with airborne opponents but doesn't have much range horizontally. The endlag of this move is deceptively little, as you can cancel it with another attack while his foot is still in the air, potentially surprising foes not familiar with Ganondorf. This also makes it a great baiting or fake-out attack, letting an opponent run close to attempt a free attack before countering with your own. It is also great for following up a down aerial on a grounded opponent during certain percentages, which can rack up lots of damage. This move is also powerful enough to KO, especially if you hit with the sweetspot, but since it doesn't have much horizontal range and how smart opponents won't stay directly above you most of the time, it is more situational than your other finishers. Ganondorf kicks twice. Although the first hit is supposed to knock enemies straight into the second, DIing can make the second move miss, leaving you vulnerable until the animation ends. It is also weaker than your other smash attacks, making it one of your lesse used moves. Its only use is for hitting opponents that roll behind you, as you don't have any ground move that can hit both sides. Ganondorf has the shortest grab range in the game, but his throws aren't bad. You will miss a lot of shield grabs or even just normal grabs if you aren't careful, usually accompanied with getting hit by an attack. Go for pivot grabs instead if you can. Ganondorf knees his opponent. It is moderately slow for a pummel, but horrendously weak for a pummel its speed. Ganondorf punches his opponents forwards. It is a quick way to knock your foes off the stage for an edgeguard attempt. It is also your most damaging throw, but don't expect it to KO. Ganondorf kicks his opponents backwards. This is another way to get your foes off the stage, and it does possess enough knockback to KO at higher percentages. Ganondorf punches his opponents back sending them upwards. It doesn't do enough knockback to KO until unrealistically high percentages, and can't be followed up with attacks, unless you anticipate your opponent's DI or airdodge. Ganondorf throws opponents on to the ground. It is rather weak and easily lets the opponent escape, but it throws them in such an angle that they're just slightly above the ground, where you'll have an easier time predicting their option selects and punishing them. Ganondorf kicks two times. This move is your second fastest aerial and has pretty good reach, making it a good alternative to your UAir. It is your only multi-hit move other than DSmash, which isn't nearly as useful, so it's a great move to punish an airdodge or sidestep. It is also your safest aerial to interrupt a juggle, as well as a decent aerial to edgeguard with due to its knockback angle. Another useful feature is that the entire animation will end if you perform it during a full jump, letting you follow up with a double jump and an airdodge or another aerial. Ganondorf punches downwards. This move is your second strongest aerial, but its slow speed means you're definitely getting punished if you miss. However, the move has a sweetspot at the tip of Ganondorf's fist, and landing with that sweetspot gives you significantly more killing power and shield pushback. This makes it much safer if you sweetspot it on a shielded opponent, and gives you a KO move with surprising range. If you decide to use thus move at all, try to always land a sweetspotted hit, as the sourspotted attack is too weak to warrant its flaws. Ganondorf backhands his opponent. This move has a bunch of advantages and drawbacks that doesn't make it particularly favorable or unfavorable, so its usage is really up to the player. It has good horizontal range, moderate KO potential and relatively low lag, but the position of its hitboxes makes it awkward to land the move. You can short hop and fast fall (SHFF) while using the move to autocancel it, landing laglessly, but doing this will cause it to miss a lot of shorter characters, due to how tall Ganondorf is. It is still a decent move against larger characters on the ground, while having enough priority to stop most aerial approaches. Tied for Ganondorf's best aerial. This move has a great number of uses due to its speed and reach. It has good range that hits everywhere but below Ganondorf, is his fastest aerial and has moderate KO potential when not stale. You can use it to stop aerial approaches and juggle certain characters, even hitting grounded characters sometimes as well. Additionally, the move has a weaker hitbox just before the animation ends that knocks characters in a downward angle, making it good for edgeguarding as well. This move should be the aerial you use the most, as its multiple functions make it too good to save for the KO. This is probably Ganondorf's best air attack. It is among the strongest meteor smashes in the game, able to KO almost all characters at very low percentages offstage. It also has surprising horizontal reach and huge knockback scaling, letting it KO most grounded characters below 100%. You can also SHFF autocancel it, letting you land laglessly and pull off multiple DAirs in a combo during low percentages, which can easily rack up almost 50% damage with two hits. The horizontal range of the move makes it good for stopping approaches, which is wonderful against aggressive opponents. Unfortunately, the move isn't without its weaknesses. Its landing lag is too long if not autocanceled, and it can be countered by other aerial attacks and fast UTilts. Ganondorf's take on the Falcon Punch, which is stronger but also slower. There is rarely a good situation to use it, as it is simply too slow for you to hit on any opponent who isn't completely distracted or downright braindead. You can reverse the Warlock Punch to do more damage, which also gives you a short horizontal boost useful as a last-resort recovery, but don't expect the reverse punch to fool any decent opponent. The only situation where you can actually use the move as an attack is when your foe is stunned by a shield break or a Deku Nut and there is absolutely no other enemies nearby, but you won't find yourself in this position very often. Ganondorf lunges at an opponent, grabs them by the neck, and slams them to the ground. If performed in the air, Ganondorf grabs the opponent and sends them down. He can grab opponents down with him as a last ditch effort, but only attempt this if you're a few stocks or points ahead as matches either end in Sudden Death or a loss if both you and your target has the same stock/points. Generally, the ground version will be the one you will be using the most. As it leaves your opponent lying on the floor, you are free to follow up with any attack (including another Flame Choke) if you predict where they will roll or how they get up. It also sets up guaranteed follow-ups on some characters, often letting you combo it into a DTilt. However, remember to only use it to punish an opponent's mistakes, not to approach, as it is slow enough for your opponent to sidestep dodge if you just throw it out randomly. The aerial version can be a passable horizontal recovery, but its uses as an attack is limited. 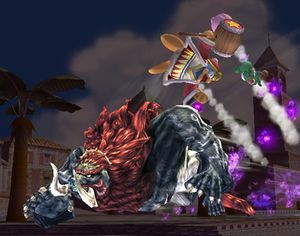 Ganondorf leaps into the air, slightly forward, and if an opponent is in front of him, he will grab and electrocute them and send them flying. It also has a normal hitbox at the very end of the move that knocks enemies skyward. Neither the grab or the punch at the end is useful for attacking opponents. You will easily get punished after grabbing your foe, and missing the move entirely will leave you open for attack, usually one that will send you offstage. It is a mediocre recovery move, but the only one you must depend on, due to its predictable trajectory and average vertical distance. The punch at the end serves to knock edgehoggers away, a feature which you will certainly need, but it doesn't make a big difference. Ganondorf kicks forward if on the ground, while he will kick downward if in the air. Although the move is rather slow and not exceptionally strong, it still has its uses. It travels quite far, has low startup lag and a lasting hitbox, so it is useful against players that sidestep a lot or airdodge near the ground. You can also use it to punish enemies too far to reach with your other moves, or use it as a follow-up after a Flame Choke if you predict where your opponent will roll. The air version has some serious KO potential, but it has so much ending lag and landing lag that you are almost guaranteed to get hit by a strong attack if it misses or is shielded. Only use it if you know it is going to hit. The aerial Wizard's Foot also has a small shockwave when Ganondorf lands which can catch enemies offguard, though it doesn't make up for the immense landing lag. You can immediately cancel the jump with a Wizard's Foot to quickly trigger the shockwave, but there are similarly fast moves in Ganondorf's arsenal that are safer to use. He spins in midair and strikes a pose and chuckles. + ( or )+ or or He punches his other hand twice and chuckles. + He pulls out his sword, looks at it in amazment, and puts it away, taunting players. Beast Ganon: Ganondorf transforms into the boar-like demon Ganon, doing 10% to enemies caught in the transformation and burying them, then strikes with two powerful attacks. The first is a stunning pound on the ground, which stuns any opponents nearby, even if they're airborne. The pound is followed up with an immensely powerful charge, doing 47% and launching enemies along with him across the screen. 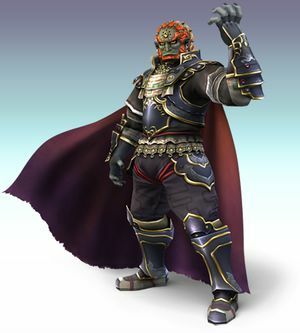 Ganondorf in his human form will return to where he was when he activated the Final Smash. To increase the chances of hitting with the attack, try to do it at one edge of the stage, letting the boar charge the maximum distance. However, on some stages this could give your opponents enough space to avoid the stunning stomp, potentially preventing you from landing the subsequent charge. Ganondorf is good agaist bowser since bowser is slow and large enough to easily hit with Ganondorf's moves. Bowser's b-down is easily countered with Dark Dive (b-up). Diddy kong is much faster than Ganondorf, but Ganondorf is much stronger. Try and stay close to Diddy and use Ganondorf's Down+ and side+ . Link is a deadly character if your opponent plays him correctly, so be careful. Link has a lot of projectiles, but they don't cause much damage. You can shield/dodge around to mitigate these ranged attacks, but if you want to win, you will need to use your down+ and side+ . Not only are these some of Ganondorf's most powerful moves, but they also help to overcome the distance that Link uses to pester you with projectiles. At a high enough %, these moves can either KO him or set you up to juggle him, at which point you can finish him off with a smash attack or up+ . Since he is the exact same as you, it will come down to skill. Use your shield and dodges to intelligently avoiding all of his special attacks. Pit is the most defensive character in Super Smash Bros. Brawl and he also has strong smash attacks (stronger than Ganondorf). Be careful when you throw projectiles at Pit because he may send them right back at you. Also, because of your slow speed, try to avoid taking extra damage from his light arrows. Your best chances are to chain grab him and keep him down and look out for the Wings of Icarus (his up+ ). When Pit uses Wings of Icarus, use your up+ . He will be unable to recover until he hits the ground or dies. The Ice Climbers excel at one thing, and that is punishing mistakes with an infinite chaingrab. Unfortunately, you happen to have a lot of moves that leave you vulnerable to a grab if they miss, even the slightest mistake can cost you a stock/point. Additionally, your Flame Choke, normally one of your best moves, becomes completely unusable due to the dual nature of Ice Climbers, and grabbing one climber sets you up for a grab by the other climber. You also have no chance of breaking through a desynced Blizzard wall, and if Blizzard is used to edgeguard, don't expect to make it back to the stage. Even using platforms to avoid chaingrabs doesn't work, as ICs can just hit you through the platform with Up Air, setting up a juggle that is difficult to escape from. Overall, the Ice Climbers matchup is extremely difficult, if not impossible. You will need to play absolutely perfect to have a chance at victory. Be sure to watch your spacing very carefully and don't ever miss or have a move shielded. Look for the opportunity to knock them offstage and edgeguard them, since normal KOs are just too risky to attempt. Against only one climber, your chances are a lot better, but you have to KO the assisting climber. The most reliable way to separate the Ice Climbers is with F-Throw, which will leave one climber offstage and hit the other climber if they're close to you. Your grab range is worse than the Ice Climbers', so don't actively try to get a grab for the throw. Once you've separated the climbers, get the assistant climber offstage and KO them immediately. Your opponent won't be able to control the second climber if you manage to separate them far enough, so you don't have to worry about a counter-attack when using your meteor smash. Without the threat of an infinite chaingrab, a solo Ice Climber is much more manageable. His normal attacks don't have a lot of range and Blizzard can easily be countered with your attacks. His recovery will also be a lot worse, as Belay does nothing and Squall Hammer can be countered with a good Down Air.